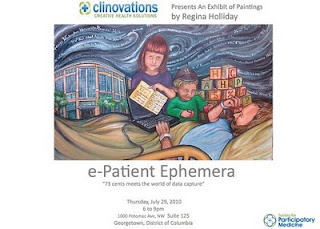 I will have an exhibition of my work on Thursday, July 29th at the Clinovations office in Georgetown. The Clinovations' mission is to: “Convene clinical leaders to share and create innovative solutions that improve the health of patients and support the healthcare system in the delivery of optimal care.”-(Clinovations website.) Not long ago I had the pleasure of speaking with some of their team, Dr. Ted Eytan, Dr. Trenor Williams, Anita Samarath, and Lygeia Ricciardi, about the blank white walls in their office. They inquired about the potential of hanging one of my patient-centered paintings in their space. The idea being that this would “incubate ideas for more regular patient involvement on the part of the consultancy as well as the clients”-(Dr. Ted Eytan.) I was all for hanging a piece in their space, but as we continued discussion the vision grew. We were all purveyors of social media: we like to share. Why just one piece, why not many? Why limit this to only Clinovations’ staff and clients? We could invite people from Gov 2.0, Health 2.0, the e-Patient movement, social justice groups and representatives from the arts community, as well as friends and family. A one-night art show was born. And what do you name a gallery show with the lifespan of a mayfly? e-Patient Ephemera: 73 Cents meets the world of data capture. Imagine an office suite usually filled with white boards, laptops and mobile smart phones, filled instead, with the 20 paintings depicting the current memes within health information technology. Imagine the ephemera of a life forming a brilliant mash-up of health information technology mixed within vibrant patina of patient rights. I love the word ephemera. It feels like poetry upon my tongue. I love what it means: printed material not intended to be kept. Items of ephemera fill our life even in a digital age. We have ticket stubs, flyers, greeting cards, brochures, and business cards that we retain far past the point of their intended lifespan. Anyone who has seen my art classroom knows that I keep everything. I am a collector of ephemera. I have every debate ballot I ever received, all of the letters my husband sent me while we courted, the playbill of every play we performed in, and a pile of paper bus transfers that span years. I love the ways ephemera can be incorporated within art to make a composition that touches an audience and depicts the meaning of a life. For too many years the medical record has been viewed as only a billing document and a piece of daily medical ephemera. Hundreds of pages of vitals, imaging results, medical reconciliation and surgeries are distilled into the few pages that form a transfer summary. At each facility this process continues; each set of daily records entering the ether of a payment structure. A daily accumulation of data that will remain untouched by many if a lawyer and a potential lawsuit is not involved. How did a document originally intended to facilitate communication and the medical history of a patient become a piece of billing ephemera? How dare institutions consign this living document a role as nothing more than a receipt of services rendered? With the advent of health information technology, the electronic medical record has the potential to leave its old role of medical ephemera and enter the virtual eternity of cloud based computing. Ah, the ability to create a lifetime electronic medical record consisting of transferable and actionable data is within our grasp. Or does this really matter? Here is where that pile of bus transfers comes into play. From 2003 to 2008, I collected bus transfers as one of many types of ephemera in my life. My husband wondered at my behavior, but I told him I planned to do an art project with them. In January of 2009 my collecting stopped. The DC metro had decided to use to smart card technology for all transfers. No more free rides due to fingers covering the time expiration, no more handing off a transfer to a thankful stranger. Billing fraud was being dealt a heavy blow by technology. But in addition to facilitating better fiscal responsibility, Smart Card technology allowed Metro transit to easily track and study usage of transfers. The bus transfer had left the world of the ephemera and had entered the world of data. We are on the cusp of that world within health information technology. As meaningful use is defined and people begin to adapt, we must guide these adapters of electronic medical record technology through the process and take great care to explain in such a way as to leave no one behind. That is where the e-Patient enters the world of ephemera. An e-Patient is engaged, empowered, equipped and is an equal. E-Patients will take every tool available, be it information technology or medical ephemera; they will use these tools to change outcomes for the better. They are a bridging population that has a foot in both worlds. They are an amazing force that can effect adoption during this transitional time. Today I experienced this struggle of transition within the microcosm of creating a post card invitation to my upcoming art exhibition. I spent the early morning talking back and forth within an email thread about the exact text and design of a paper post card. As we went back and forth on details, one person questioned why was I doing this in the first place. Was I actually going to mail this? I assured them I would mail some but I also wanted to post some in the neighborhood. Not everyone is using online communication. This is a vital consideration as we push for access to the electronic medical record. We must communicate the need for a adopting this new technology in many ways. I paint to draw attention to the importance of adopting a transparent and accessible electronic medical record. Another way, I spread the word is by creating a postcard for this upcoming show. I am making a piece of e-Patient ephemera. I hope you can come to the show and see the art for yourself. And don’t forget to pick up one of the postcards while you are there--it will remind you of the importance of ephemera. On Saturday, June 12th, I got the call. Could I help Murch Elementary Class of 2010 create their end of class project? Each year the departing class creates a gift for the school. It is often a painted bench or some type of art piece. The time and budget was severely limited. I would have to work with the children and create a piece in a scant three days. And these were not traditional days. These were the last days of school. They were filled with graduation rehearsals, field days and summer vacation induced absenteeism. This was an eleventh hour project. Would I be willing to help? They were crying, “Rescue Me!” at the proverbial last minute. But, I wonder if they knew I was the one being rescued? June 17th 2010 was the one-year anniversary of my late husband Fred’s death. Instead of pining or wallowing in sorrow, I was up to my elbows in paint and gel medium surrounded by happy children who had been classmates of my son Freddie. Oh, I well know that can art assuage sorrow. I have had a hard life. It has never been easy. As child in fear and sorrow, I begged God to help me. “Please, rescue me,” I prayed. He did not take away the causes of my sorrow, but instead sent me Art. I painted, I drew and I coped. I struggled in school. First grade was a blurry lack of understanding. I vividly remember my confusion about letters and numbers. I could not understand what they wanted. The teacher told me “A” was for apple. Great, I get it. A=Apple. No, I was wrong. She tried to explain phonics to me and I didn’t comprehend. I could not read nor write well, but I could draw. I would draw an apple and then she would understand. That plan didn’t work. On the last day of school she gave me a card with the pictures of bees buzzing by. It was a note that said I would have to return and repeat first grade. “I would bee back.” Even as a child, I abhorred the cheery monstrous tone of this note even though I could not puzzle out all the words. I had flunked. My few friends were now in a second grade. This year my class was the over-flow first grade in the basement of the school. It was one of very few classrooms at that level. It was dark and smelled of must and mold. I could not help but feel this was some kind of punishment. Mid year our room was vandalized. The vandal that broke in poured endless ribbons of our school glue throughout the room. For the rest of the year, the chalkboard was challenging to use due to all the raised lines from adhesive. I still did not really understand reading and math. I would draw elaborate pictures of the concepts that the teacher spoke of. Perhaps if I could draw it, she would be pleased. She was not. I spent endless hours in the principal’s office … drawing. When I would be released to recess, I would run immediately to the far corner of the playground. I would pick up the pieces of Oklahoma sand stone and methodically rub them against the concrete wall. At first, they were an inexpensive chalk. As rubbed longer, I realized I could sculpt the stones by rubbing them. I made primitive carvings this way. I still have one of them today. When I watched Steven King’s “The Shawshank Redemption” in 1994, I thought of the seven year old me trying desperately to stave off the loneliness and feelings of imprisonment by carving stones like a little Andy Dufresne. Stone carving takes a long time. It is an art form adopted by those who measure time in weeks and days not minutes or hours. As if school was not enough anguish, my father was torturing me at home. With words and belts and switches, he was making every day a private hell. I wondered what I had done wrong to suffer so. It is hard to be seven years old and wonder if you were going to die. Yet, I could draw, and God sustained me. The years past and due to the amazing work of my fourth grade teacher, I began to read at grade level. Now my paintings would often accompany writing. I was discovering prose and poetry. In each piece I would try to place a subtext that was a cry for help. I loved poetry and paint. In these art forms you can tell people again and again that you really want to die, and the audience sees the beauty but not necessarily the despair. I loved subtext. It was a great way to avoid making a clear declaration of pain. Occasionally, I would have a teacher who would read my journals and wonder. They would write comments in the margin, but would not follow up. It was easier, I suppose, to let sleeping subtext lie. Again and again throughout my life I would turn to art to rescue me. When the sadness became unbearable I could paint a picture, write a poem or perform dramatic piece. I could let all the anguish inside of me pour into the action of creation, and it was beautiful. I began to working in retail in the early 90’s. I sold art supplies, books and toys for 15 years. I worked twelve years at Barstons Child’s Play in Washington, DC and three years at Jayhawk Bookstore in Lawrence, Kansas. Each a student or parent would come into my art section and say, “Rescue me.” A project would be due within hours the customer would need my expert advice on how to finish or salvage their work. This was not active art on my part, but I loved helping them. I loved building up the work inside my head seeing all the potential pitfalls and helping them avoid them. They were anguished, just like I had been and I was happy to have the chance to help them through art. As the years past and word of mouth grew, people would call Child’s Play just ask me about school art projects. My boss, Steven, would show such patience with customers whom would talk to me for thirty minutes buy a few items and leave. He understood that the customer would remember we had helped them out in their time of stress. We had listened, asked questions, made eye contact and gave the customer options. I do believe that part of my horror at the way my husband was treated while hospitalized was due to all the years of excellent customer service by the staff of Child’s Play. We were treated very often with neglect and avoidance while Fred was dying. I would never have treated a customer buying a toy in the way we were being treated. After years selling art supplies, I began getting requests to help with school auction projects. In DC, most schools have an annual auction in which class creations can raise money for the school. I was sometimes called to help with this process. At first it was just a couple schools that asked for help, but the spring of 2010 was the year I had the most requests. In the months of January, February and March of 2009, I helped five schools. I was doing projects at CCBC, Temple Sinai, Murch, Little Flowers and St. Bart’s. Our tiny one bedroom apartment was covered in art supplies. 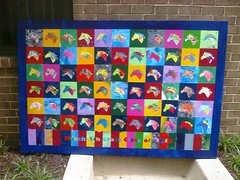 In total I was working on 19 different canvases with hundreds of different children. In addition, I drew 150 close to life-sized body drawings of all the students of CCBC depicted as Circus performers. It was a frenzy of art. I had never done this level of art out-put at any other time in my adult life. I guess God was preparing me for what was to come next. On March 27th, 2009 we found out Fred’s body had tumors and growths. He was in the hospital. I still had several pieces I need to finish that I had begun. The night of the 27th I needed to finish the piece for Little Flowers. It was a Warhol inspired self-portrait series of the entire kindergarten class. The Auction was the next day. There was no more time. I heard later that that piece went for several hundred. I wonder if they owners have any idea how valuable it really is? Normally, when I adhere rice paper onto canvas I use a lot of water and gel medium. This time I used gel medium and tears. I cried for all of our lost tomorrows into that bright canvas. Art and sorrow were so intermingled within my life. As the weeks past by Fred grew worse. He lay in his hospital bed. He could no longer walk. I sat beside him and began to cut out the cherry blossoms that Mrs. Schaffer’s 2nd grade class at Murch Elementary had painted onto rice paper. These were part of a composition that framed an acrylic painting of the Washington Monument in cherry blossom branches. It had been a cool spring. Outside the cherry blossoms were just beginning to unfold. Fred looked over at me. My lap was filled with painted paper cherry blossoms. “I guess I will miss seeing the cherry blossoms this year,” he said. I looked up at him. He continued, “I hope I am here to seem them next year.” I looked down quickly and continued cutting so Fred would not see my eyes fill with tears. The next day I brought the finished painting to Mrs. Schaffer’s Class. The teachers circled around me and held me close as I sobbed. Other than the few glimpses Fred would see during his ambulance transports for radiation, Fred would never see cherry blossoms again. Fred died and I began to paint. I painted and blogged and wrote speeches. I never stopped doing creative endeavors. In a frenzy of creation, I didn't feel so lonely. God was with me and filled me with a sense of hope. I was in his arms. I was not alone. So when the parents from Murch Elementary called me with their plea for help, I could not help but say yes. They had not dropped ball, they had merely thrown it to me. Each toss affected lives and hearts, until 61 fifth graders and a widowed artist and a fellow art teacher had created a thing of beauty. I found the peace that surpasses all understanding, while gluing row upon row of mustang head paintings onto a canvas. There are 66 Mustang heads on this piece. 61 of them represent the students who graduated. Five have no names upon them. They represent the ones that moved away, the ones that started the journey with us and are with us no longer. But in the creation of art they are with us still, and we are not alone. Thank you, Debra, and thank you to everyone at the National Partnership for inviting me here today. I am an artist, a widow and the mother of a child with autism – and, like all of you, I am an activist for better care. From January to March of 2009 Fred went to his primary physician a dozen times with complaints of pain. He visited two ER’s with severe pain and was sent home with pain med’s each time. After two months of this, I demanded a diagnosis. On March 25th he was hospitalized for additional tests. On March 27th the oncologist told my husband while he was alone and told him he had tumors and growths. We had no access to the written record and were given brief verbal summaries by the on-call doctors. We were continuously hospitalized in five different facilities in what would be the last three months of Fred’s life. Fred had a broken hip because a careless shove on a point of metastasis during a transfer for radiation, skin breakdown because of inconsistent bedding changes, and avoidable complications because nobody was communicating. No one had all the information they needed to see the whole picture of Fred. This experience was horrible that I became and advocate for patient access to the electronic medical record. Perhaps our worst experience was his transfer to a new hospital with an incomplete and out-of-date transfer summary. As a result, Fred was denied pain medication and food for six hours as the staff at the new facility tried to cobble together his medical record using a phone and a fax machine. When I had asked for his electronic medical records 6 days earlier, I was told that it would cost 73 cents per page and that there was a 21-day wait. I was astounded. This was a hospital with fully functioning electronic medical record system, yet they were asking us to wait 21 days and spend hundreds of dollars just to see Fred’s record. I eventually got a copy of Fred’s record and – despite its many errors– it became a virtual bible that we used to guide Fred’s care for the last 56 days of his life. There was not a day I didn’t reference it, and that information extended Fred’s life and helped create a fragile peace within our hearts; for there is no greater sorrow then watching your loved one suffer while you feel helpless because you don’t have the information to know what’s going on, what he needs or how to help. That is why I am working so hard for clarity and transparency of electronic medical records. I may not be an expert in medicine, but I am an expert on my husband. With access to his medical record, I could explain his treatment options and help ease his mind. When I speak, I’m often the only person in the room without a degree after my name. I am glad there are so many educated professionals working on health information technology, but it’s also important for patients and caregivers like me to be heard. Thank you for organizing the Campaign for Better Care, to give us a voice. I said when I began that I am an artist; I paint images of data. I depict silos and closed data-loops in an effort to warn others of what can happen when patients are left out of the solution. That’s one of the ways I speak out for Fred. I am his voice and, I hope, your voice. We are all be patients in the end. We all have the right to be treated with dignity and respect. Thank you. This is a guest post By Michael Wenthe. Michael was one of Fred's friends and also a professor at American University. He visited Fred in every hospital setting and hospice. His last visit was the day before Fred died. You can read Michael's own blog posts about Fred and "73 Cents" at http://satisfactorycomics.blogspot.com/2009/12/regina-hollidays-mural-for-health-care.html. On the anniversary of Fred's Death I thought Michael's writing was the perfect way to commemorate this day. "Since I first read James Joyce’s Ulysses in 1994, I have joined other readers of that work in thinking of June 16 as Bloomsday, a celebration of the novel’s achievement in chronicling a day in the life of Leopold Bloom, fictional Dubliner, in 1904. Of course, Joyce had other reasons for choosing that particular date, for it was the actual day, not fiction, when he and his future companion and eventual bride-to-be Nora Barnacle “went out walking” for the first time. For an atheist author who refused his dying mother the consolation of pro forma Catholic piety, the choice of June 16, 1904, as the temporal setting of his magnum opus seems a remarkable bit of sentiment on Joyce’s part. For all that June 16 is widely celebrated as a day for reading Joyce, others have a part in it, too. Just last year, fifteen years after I first read Ulysses, I learned that another novel of epic scope begins its main action on June 16—not a novel about Stephen Dedalus, but a novel by Stephen King: The Stand. I’m not aware of any groups that celebrate June 16 as Tripsday, but I’m convinced that King dated his own magnum opus with a winking eye at his Joycean predecessor, a direct allusion to the odds-on favorite for greatest English-language novel of the twentieth century. I finally read The Stand last year on the recommendation of Fred Holliday, whose defense of Stephen King against the denigrations of high-culture snobs, won my admiration not just for King’s power as a writer but for Fred’s independence and judgment, his refusal to let the academy’s tastemakers and self-appointed guardians of culture distort his own sincere but by no means naïve love for the work of such popular artists as Stephen King in fiction, or Steven Spielberg on film, or Joss Whedon on TV. Fred wouldn’t have had to make excuses for so-called low or popular culture against high culture, anyway, because he knew enough of the highfalutin material to hold his own in discussions of “canonical” work. His dissertation, The Long View, may have focused on Buffy the Vampire Slayer, but he nearly wrote on the seemingly more difficult and esoteric traditions of Chinese cinema, about which he could hold forth at length with the same knowledge and passion that he brought to conversations about Buffy or The Stand. As it also happens, I have my own June 16 to commemorate, though I’m too subdued by it to feel much like celebrating. June 16, 2009, was the last day I saw Fred, the day before he died. I had just come back from a family visit to Vermont, and I had a present for Fred that I’d picked up in the airport: the latest issue of Esquire with a brand-new story by Stephen King. I doubt he got a chance to read it, given how tired he seemed during our visit. But despite his weariness, Fred gave me a lot of his energy and attention, and we had a conversation that has remained with me vividly—perhaps because I think about it often. He asked about Rebecca and the progress of her pregnancy; our daughter-to-be, Shira—still known only as “Juniorina”—was due about five weeks hence (and one of my greatest regrets is that Fred never got to meet her, nor she him). He also asked me, for the first time, about my conversion to Judaism. I’m not sure when, exactly, I let it be known that I had in fact converted, and from Catholicism, no less—the native religion of the atheist James Joyce as well as the uncertain Fred Holliday. It’s hard not to speculate about Fred’s state of mind in asking about religious matters on what turned out to be the eve of his passing, but that’s another matter on which I must remain agnostic. I had nothing especially helpful to say on the question of certainty; precisely what appealed to me about Judaism, or at least the version that I practice, was its openness to theological questions and existential struggles as against the dogmatic certitude that characterized the Catholicism I’d been raised with. That’s what I told Fred, at least, though I wished I had more to offer. We also talked about books and movies, as usual. In Vermont, I’d made a start on World War Z (“An oral history of the Zombie War”) after my brother-in-law finished reading it; I’d remembered that Fred had both read the novel and listened to the audiobook back when he was first being treated (if that’s the word) at Holy Cross Hospital. Now, incredulous that the only zombie movie I’d seen was Shaun of the Dead, Fred insisted that I borrow a film from his personal collection before I left: Zombi, Dario Argento’s European cut of George Romero’s Dawn of the Dead. Now, it took a while for me to watch Zombi. My priority had been Buffy the Vampire Slayer, since I loved comparing notes with Fred about the series—hearing his expert take on characters, events, narration, and framing—and I was still well behind where I wanted to be when we lost Fred. I’m especially sorry that I didn’t get to compare notes with him about Season Six of Buffy, which might well be my favorite of the series. That season offers a curious analogue to Zombi, however, which I did finally see some while after Fred’s funeral; for Season Six of Buffy begins with the resurrection of the recently-departed Buffy Summers. Buffy’s no zombie when she comes back; but like the reanimated beings of Zombi, she was better off between her lives, having apparently been in Heaven when her friends, at a loss without her, contrived to bring her back to earth with dark magics. It’s a painful irony to me that the last movie Fred recommended to me was a chronicle of how the living need the dead to stay dead; and it’s another painful irony that my favorite season of Fred’s favorite television show offers the corollary lesson that the dead may need the living to preserve them as they are, not to seek their return—as the only way of honoring them as they were, in life, without risking unknown damage to the person who was loved and lost. I write this wishing so very much that Fred were still with us; but if these movies and films teach us something important about existence, it’s that there’s a crucial difference between still with us and again with us. We can’t have Fred back again as he was, but he still is what he was when we seek him in our memories, where he is always to be found. In that sense, I feel like my memory of Fred, replaying the same scenes over and over, is like reviewing film of beloved stories whose meaning is inexhaustible even if the narrative is now at an end. For me, it’s not so much that Fred is “back on the show,” as Jeff Middents suggested last year, as that he’s never left. On that note, I want to mention one more movie that Fred recommended to me before I close with another reflection on today’s date. During one of our conversations about his work, Fred spoke of his love for the Chinese director Zhang Yimou’s film To Live. Rebecca and I finally watched To Live some months after Fred’s funeral; the film was profoundly moving, not least as a testament to the need to persist in life despite loss. For the film is shattering in the privations and heartbreaks it deals out to its protagonists, who grow and develop in utterly unpredictable but ultimately convincing ways, not despite but because of their terrible losses and hardships. The film somehow concludes on a note of optimism without either ignoring or forgetting the worst of what had led to its hopeful ending. Against the supernatural horrors and unrealities of Zombi or Buffy the Vampire Slayer, To Live shows us what we face and what we have; and although I cannot thank him now for having recommended it, I remain grateful to Fred for affirming life through the medium that he loved, even after death. A year ago today I saw Fred alive for the last time. Tomorrow, July 17, marks the first anniversary of his passing. In traditional Jewish practice, a candle is lit on the anniversary of a death, in commemoration of the life that was—not unlike the way that the Catholic Church celebrates saints’ days not on the birthdays of saints but on the days of their martyrdoms or deaths, when they awoke to a new life—albeit a different and mysterious life, one that still seems unknowable to me. But there is one conditional wish that I know I can render in the emphatic indicative mood. The traditional Jewish phrase to accompany the news of a death or the mention of a lost beloved is to say, for a man, zikhrono livrakhah—may his memory be for a blessing. I have remembered Fred every day of this year now past, in fondness and in longing; and I know with the certainty of experience that his memory is and has been a blessing, and it will remain so as long as I have the capacity to remember." 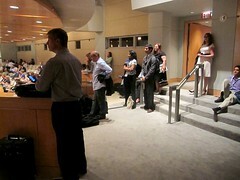 On Monday, June 7, I had the pleasure of attending the "Health 2.0 Goes to Washington" conference. It was a meeting of great minds. Attendees came from all over the United States and included representatives from the government, medicine and information technology. In this heady mix of professions, patient advocates were liberally sprinkled. I was so excited to see that every panel had a patient representative. This was such a change. At this point I have attended quite a few medical conferences. I have never seen such an amazing selection of patient speakers. I also noticed this conference differed in other ways. I was intrigued by the all the people standing along the sidelines watching the speeches. There were plenty of seats available. These were nice upholstered theatre-style seats. Yet people were standing or lounging on stair steps. I looked around. Were they attempting to play hooky? Were they standing up in order to more easily join in a hallway conversation? I looked out in the hallway. Nope, no one was goofing off or socializing. I sat down myself, only to stand 15 minutes later. I joined the standing ones. I was so filled with energy and excitement that I could not sit. I could not be contained like that. I looked among those standing. I noticed a lot of techies and early adapters. I saw a group of people who might have been termed ADHD. I saw people who would not sit still. Thank God for these people who refuse to sit still. They refuse to wait for incremental change in our medical system. Thank God for sites such as Jamie Heywood’s Patients Like Me or Trisha Torrey and her blog Every Patient’s Advocate. Thank God for David Hale at NIH working on the Pillbox program that will enable the rapid classification pills by appearance alone. These amazing people were willing to stand up and create positive change within the system. To outsiders the standing ones may have seemed foolish. After all, there were plenty of chairs. Foolish or genius: it is just a matter of perspective. Sometimes you just can’t sit still and wait for change. Looking back, I have always had a hard time sitting still. As a child I would sit beside my mother in Church and draw on my children's bulletin in order to channel my energy in a positive direction. I know it is important to pay attention in church, but I thought God would not mind if I drew pictures from the Bible. Even though my mother often wondered why I couldn’t keep quiet like my little sister, she treasured these Church drawings. She still keeps some of them in her hope chest. In my years of teaching art I have seen many versions of Noah’s ark. But for the most part each picture contains a boat and animals and a sunny blue sky. I never saw a picture of what lies beneath until Freddie’s drawing. I guess it is just a matter of perspective. Both images are equally valid and each focuses on a different part of the story. In health care, I think we are often blue sky focused. Do a Google image search on patients. You will be amazed at all the smiling patients in full make-up. Where are the desperately sick or ill? Where are the dying ones? I am so happy that at the Health 2.0 conference we got to hear so many different perspectives. I am very happy that Trisha Torrey asked about the government acronyms that were being rained down upon us. She pointed out that being flooded with data did not help if you couldn’t understand. I am very thankful that we got to see the slide show from Jonathan Kuniholm and the Open Prosthetics Project that compared the technology growth of the telephone to that of the prosthetic arm. If the growth curve had remained the same we would still be using the rotary dial. I am very thankful that Health 2.0 was a conference filled with so many different perspectives. I am very thankful that Mathew Holt invited me to speak about the patient’s perspective on the EHR. I am honored that Gilles Frydman asked me to present on the Patients 2.0 panel. Such divergent thoughts opened so many windows of opportunity. I am glad there were so many speakers who challenged us to take action. I know I for one, won’t take that challenge sitting still. When I was in high school, I worked at a children’s program during the summer. In the morning I would teach art and in the afternoon we would have free-play and then a field trip. Kids could play outside or sit in the air conditioning and watch a video… or they could listen to me tell a story. I found it amazing at the time, but they invariably chose that they would like to hear a story. Perhaps you are picturing a few kindergarteners nestled up to my chair listening to a classic fairy-tale. The real situation consisted of me in a school cafeteria telling stories to 100 children from five to twelve years of age. Their sweaty bodies leaned this way and that as they sat on the cool mismatched linoleum and strained to hear each part of the tale. No, these were not just fairy stories. I told of history and comedy and sometimes even… horror. They sat in rapt attention following every part of the tale and as the story ended they begged to hear another. I was so happy that in age of television children would still sit and prefer to hear a story. Looking back, I realize that re-watching The Muppet Movie couldn’t hold a candle to a storyteller. Stories are powerful things. Stories stick inside your mind and make you think. My husband Fred spoke often about the importance of story. (The last book I bought him was The Origin of Stories: Evolution, Cognition and Fiction by Brian Boyd. He was excited to try to read it, but only finished the introduction. He told me theory and Dilaudid do not mix well.) He was so excited by the theory of narration. I love to tell people that my husband wrote his dissertation on Buffy the Vampire Slayer. It always gets a great laugh. But few people know the title of his book. It was called The Long View: Three Levels of Narration in Buffy the Vampire Slayer. His thesis asserted that Buffy was filled with long stories. Each episode had a narrative arc. The season was a longer story, and the seven year series contained an even longer narrative arc. Buffy the Vampire Slayer might have seemed like a monster of the week serial at first glance, but as the show progressed, a clear mythos developed and a plot arched throughout. On the surface you may believe this show was about vampires and demons, but within a fantastical structure it was really a treatise on life and death and endurance. This show depicted a reality where a computer nerd or a cheerleader could save the world. Pretty empowering stuff, don’t you think? Fred spent a lot of time working on his dissertation. He was very proud of it. Sadly, for many years I did not read it. There were plenty of reasons not to read it. It was really thick and complicated. I was so busy with work and the kids. I had already watched the entire series with Fred and talked about it endlessly, why read a technical document on the subject? And, in some ways, I resented it. I resented the years I had worked long hours at so many jobs while he finished his education. I resented the money spent and the life goals delayed that were part of the realization of this document. No, I didn’t read his dissertation, until he was dying. I remember that night well. Fred was still in rehab but he was failing fast and had agreed to enter hospice. I spent the night with him because I was so worried. I sat beside him and read his book. It took about five hours. At 3:00 am I finished. I looked over at him. His eyelids fluttered. He looked at me. “Honey,” I whispered softly. “I just finished reading your dissertation. It is really good.” He stared at me with a sense of resignation and disappointment and said, “That’s nice.” He then closed his eyes and resumed his slumber. I sat there numbly with silent tears streaming down my cheeks. I had waited too long. I hadn’t read it when it mattered. I hadn’t read it when it was symbol of accomplishment, a beacon of hope, the promise of a better future after years of hard work. I hadn’t read it when it was a promise of great things to come. The book lay limply in my lap. It was a testament to what could have been. I have been thinking a lot about stories of late. I just returned from Kansas City. 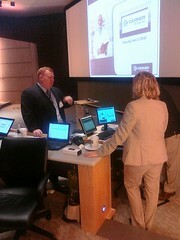 I was asked to speak before a Meaningful Use Summit hosted by Cerner. They had heard an audio copy of my testimony from the Meaningful Use Workgroup in April and asked me if I would be willing to present a patient viewpoint at their next summit. The folks at Cerner were gracious and kind and spoke with genuine sincerity about the need to hear the patient “voice.” I spoke for about 45 minutes telling our story. I told a tale of sorrow and miscommunication. I expounded on the dangers of a medical record that is not accessible to the patient and caregiver. I explained how lack of access can directly impact clinical care and emotional well-being. At the close of my speech, the audience asked what they could do to help effect change. I suggested they invite a patient advocate speaker to every medical conference. A patient speaker makes this personal. They center the room and shine above the bar charts and graphs, reminding us why we decided to work in medicine in the first place. I also said they should consider patient members on their boards. The patient needs their voice in the room and a seat at the table. Yes, we want access to the medical record so we can effect change in our own care, but we also want to help others. So, that is what some doctors think of us. Perhaps they believe our revelations are an entertaining break with no functional application. Or are we the metaphorical equivalent of a roadside fatality? Each driver craning his neck in order to view the carnage as they pass by. Or do they resent us as angry accusers spouting recriminations with no helpful suggestions to add? Do we just lay our grief on their table and walk away? Perhaps have they forgotten the meaning of story. Remember sitting on your mother’s knee. Remember the tales of childhood. The story was simple, repetitive and had a point. I remember each time a story was told, this question was asked: “What is the moral of the story?” Before we could even read a book, we were asked about meaning of stories. I won’t deny that the medical record is dense and technical. I know some patients will never want to read it and may resent the document. It took three hours to read Fred’s medical record and I read it four weeks too late. Fred’s care would have been substantially better, if I had just been able to read the record. There was no other person reading that document that was more engaged in trying to understand the story of Fred. I paint and speak in the hope that we can have a system that allows medical records access to patients while the data is still actionable and the document can still help people lead healthier life. I challenge you the next time you hear someone speak disparagingly of patient stories or Meaningful Use, to think of this post and the moral of the story. Think of me telling our story in front of a crowd at a medical conference or at bedtime with my two sons. My sons like fairy tales, but they much prefer I tell them the tale of a day of their lives when Daddy was still alive and we were still that family. And sometimes my eldest tells me a story as well. He tells me that after his Daddy died, Mommy took up brushes and tried to change the world. And he tells me the moral of the story: when you see something is wrong you do something about it.